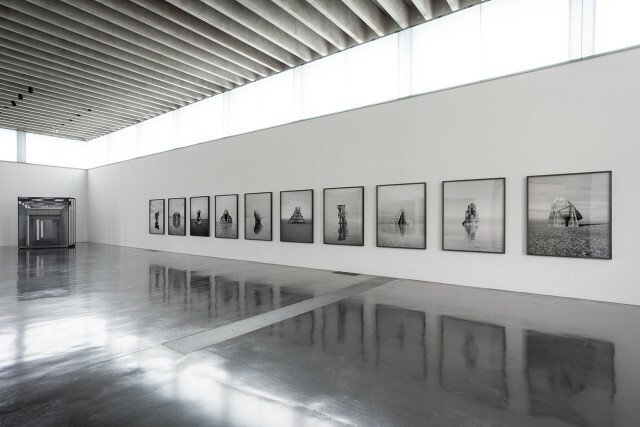 The New Art Gallery Walsall is delighted to present the first solo exhibition in a public gallery by French artist Noémie Goudal. Comprising new photographs ('Observatoires', 'Satellites', 'Tectonique') and stereoscopic images, The Geometrical Determination of the Sunrise will also see Goudal extend her photographic practice into the area of film and installation for the first time. 'Tanker/Diver', a multi-screen film involving two contrasting performances staged within an oil tanker and on a semi-ruined coastal diving board, has been commissioned by The New Art Gallery Walsall expressly for this exhibition. Goudal is known for her large-format photographs, inspired by secluded and isolated places with huge narrative power. Her new works refer to Brutalist and Cosmic Indian architecture and explore the artist's ongoing interest in geomorphic structures and the relationship between nature and artifice. Noémie Goudal works between London and Paris. She was a recipient of the 2013 Prix HSBC pour la Photographie award and featured in Out of Focus: Photography (Saatchi Gallery, London) in 2012. The Geometrical Determination of the Sunrise has been produced in co-operation with Foam Fotografiemuseum Amsterdam, where the exhibition will tour in 2015. A limited edition artist book accompanies the exhibition featuring a text by esteemed curator, writer and Director of Nationale du Jeu de Paume in Paris, Marta Gili.